In September 2018, a tsunami struck the Indonesian island of Sulawesi, causing widespread damage, especially to the city of Palu. 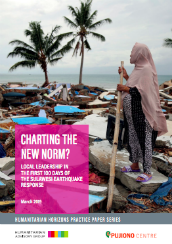 After the Palu and Lombok disasters: A new chapter of disaster governance in Indonesia? Indonesia: Would a better tsunami warning system have saved lives in Sulawesi?